Click to viewProject Milan is in fact a touch-sensitive table as you guys speculated and we reported earlier. Dubbed "Surface" and five years in the making, it's set to establish a paradigm of what Microsoft calls "surface computers" which use touch as the sole method of input. Painting with surface sounds particularly intuitive (and fun): you can use a paint brush or simply dip your fingers into virtual paint cups. Photo resizing and stacking works much like the iPhone's zoom gestures. Also cool is the capacity for multiple users. Such sweet tech comes at a price, naturally, with the units running $10,000 a pop. But, Microsoft expects prices to plummet over the next three to five years to the point they'll be in your homes. In the meantime you'll be able to play with them at T-Mobile stores, Harrah's and Sheraton hotels. Got more questions? Hit the jump for a FAQ and (naturally) a boatload of pictures. Update: And a video! Microsoft Surface™, the first commercially available surface computer from Microsoft Corp., turns an ordinary tabletop into a vibrant, interactive surface. The product provides effortless interaction with digital content through natural gestures, touch and physical objects. Surface is a 30-inch display in a table-like form factor that's easy for individuals or small groups to interact with in a way that feels familiar, just like in the real world. In essence, it's a surface that comes to life for exploring, learning, sharing, creating, buying and much more. Soon to be available in restaurants, hotels, retail establishments and public entertainment venues, this experience will transform the way people shop, dine, entertain and live. At a high level, Surface uses cameras to sense objects, hand gestures and touch. This user input is then processed and the result is displayed on the surface using rear projection. Surface computing is a new way of working with computers that moves beyond the traditional mouse-and-keyboard experience. It is a natural user interface that allows people to interact with digital content the same way they have interacted with everyday items such as photos, paintbrushes and music their entire life: with their hands, with gestures and by putting real-world objects on the surface. 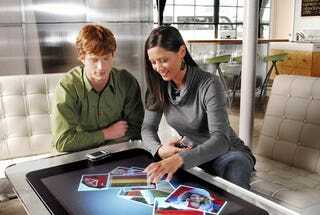 Surface computing opens up a whole new category of products for users to interact with. What are the key attributes of surface computing? • Direct interaction. Users can actually "grab" digital information with their hands and interact with content by touch and gesture, without the use of a mouse or keyboard. • Multi-touch contact. Surface computing recognizes many points of contact simultaneously, not just from one finger, as with a typical touch screen, but up to dozens and dozens of items at once. • Multi-user experience. The horizontal form factor makes it easy for several people to gather around surface computers together, providing a collaborative, face-to-face computing experience. • Object recognition. Users can place physical objects on the surface to trigger different types of digital responses, including the transfer of digital content. How does Surface benefit consumers? Surface breaks down the traditional barriers between people and technology, providing effortless interaction with digital content. Similar to the way ATMs changed how people got money from the bank, Microsoft is changing the way people will interact with all kinds of everyday content, including photos, music, a virtual concierge and games. Common, everyday tasks become entertaining, enjoyable and engaging, alone or face-to-face with family, friends or co-workers.